A simple, easy to use and accurate monitor. Panasonic have variety of blood pressure monitors with rich features. In addition, they are comfortable and reliable. Panasonic is a trustworthy brand and you can trust it to measure your physical health being at the comfort of your home. The cuffs are very comfortable and fits for most people. Digital Filter Technology:It comes with the Digital Filter Technology Sensors that detect the essential pulse oscillation while eliminating other noise factors. This will also help to avoid over-tightening of the cuff, thus leading to reliable and quick measurement. Irregular Pulse Function: EW3006S portable wrist blood pressure monitor uses irregular pulse function to ensure maximum accuracy. If there is any irregular pulse or arm movement, this function detects and alerts automatically. As a result, on such discrepancies, you can measure your blood pressure again. Body Movement Detection: Correct cuff placement and putting your arm or wrist properly will lead to accurate measurement. Body Movement Detection Sensors detect your body movement, arm or wrist motion and alerts you if there are any inadequacies. Thus, letting you know when to take another reading. The special feature of Panasonic wrist blood pressure monitor is to record the reading while inflation, it prevents over tightening of cuff. This feature provides the comfort that you require while measuring your blood pressure monitor. The cuff size is 12.5 cm to 22.0 cm (5”- 8.8”). This cuff size is adequate for most of the people. Touch of a button: Panasonic portable arm blood pressure monitor inflates with the touch of a button. There are no manual efforts required to inflate the cuff. Hence it is quick and easy-to-use. Also, you don’t need any special training or professional help to operate this device. Flash Alert: Panasonic portable arm blood pressure monitor has flashing warning system which will automatically flash alert, if your readings are above 139 on Systolic or 89 on Diastolic. These readings indicate hypertension. If you are getting these readings then it is a good time to see a doctor. Large Display: The large LCD display panel of the monitor, displays blood pressure readings and pulse rate simultaneously. It includes large and clear characters, making reading more legible. Memory Storage: It captures and save up to 90 readings automatically. Automatic memory storage feature helps to track the readings over a period of 3 months. Carry Case: Panasonic portable wrist blood pressure monitor comes with storage pouch for convenient portability. The cuff rolls around the monitor and fits neatly into storage pouch. The monitor is Slim and Easily Portable. The cost is reasonable for the value this monitor provides. It is a good price for a wrist blood pressure monitor. Includes 4 “AA” Alkaline batteries. AC Adaptor not included. Panasonic EW3006S is easy to use and have some good set of features. It provides various features such as flashing warning system, one-touch auto inflate, body movement detection that are beneficial in monitoring your heart health easily and conveniently.If you are looking for an accurate and in budget wrist blood pressure monitor, this could be a pretty good choice. 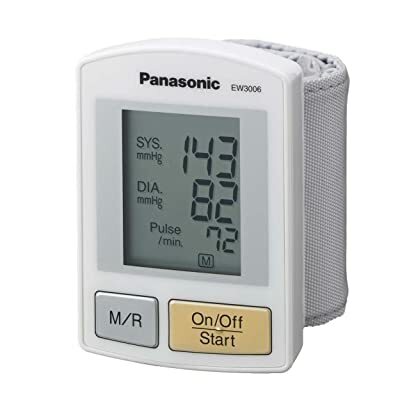 If you are looking for portable upper arm blood pressure monitor then, Panasonic EW3109W portable upper arm blood pressure monitor can be your choice.